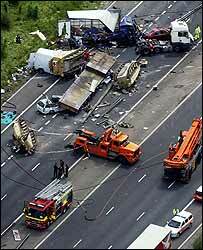 Five people have been killed in an 11-vehicle pile-up on the M1 in Leicestershire. Eyewitnesses say the accident happened after a military transporter jack-knifed and scattered armoured vehicles across the carriageway. Up to 60 emergency teams were involved in cutting survivors from the wreckage, airlifting two people to hospital in Birmingham and taking a further six to the Leicester Royal Infirmary. Four people died at the scene or soon afterwards and one of the people airlifted to Birmingham died later in hospital. Several cars and lorries collided with the army vehicles north of Junction 19 near Lutterworth just after 0730 BST on Wednesday. The motorway is closed southbound between junction 21 and the M6, and northbound between junctions 19 and 20. 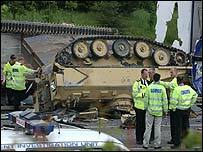 Two armoured vehicles were left upturned on the carriageway, which was also covered in debris. Motorist Brian Brooks, who saw the accident happen, said: "The trailer broke away and spun around, jack-knifed, and went through the central barrier and the tanks rolled off. "Everything they hit - well - they didn't even look damaged. They just smashed everything in their path. "Carnage was the right word." The BBC's Anthony Bartram, was travelling just a short distance from the collision. He said: "In front of me is a scene of absolute carnage and the police helicopter is hovering above. "The air ambulance is in a field just adjacent to the M1 and it looks like they are lifting someone out of the wreckage. 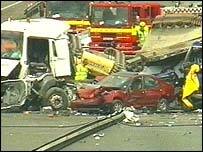 "It looks like there are anywhere up to five lorries involved at least three have been smashed to pieces." The Ministry of Defence (MoD) says a civilian vehicle pulled in front of the transporter, causing it to jack-knife. A spokesman said three lightly armoured Scimitars - which had just come back from the Gulf - were involved. They were being taken from Marchwood in Hampshire to the army's base in Catterick, North Yorkshire. It was not yet known which regiment they belonged to but it is not thought any MoD personnel were injured in the crash. Motorists are being advised to avoid the area if at all possible, and tailbacks are stretching into Northamptonshire. A police spokesman said the motorway may not re-open until Thursday morning. Traffic was diverted to other routes but the M6, M69, A14 and A46 were all affected by the congestion. A spokesman for the Automobile Association said: "It's a bleak scenario. It's effectively bringing the region to a grinding halt. "The M1's a key north-south arterial route and once that's in a stranglehold everything comes to a halt, like a concertina effect." The M1 is believed to carry about 150,000 vehicles a day, he said. England fans travelling to tonight's Euro 2004 qualifier against Slovakia in Middlesbrough were expected to be hit by the delays. Phil Morris of the East Midlands Ambulance Service said: "We would ask people to think carefully about making 999 calls as this incident has put a large hole in our resources." The weight of the military vehicles means police will have to wait for specialist equipment to be able to move them to clear the carriageways. "A transporter carrying tanks back from the Gulf crashed through the central reservation"